Help the Louisiana flood victims – Donate Now! To provide immediate and ongoing assistance to those affected by the August flooding that inundated 20 parishes (counties) in Louisiana, Catholic Charities of Southeast Michigan is collaborating with local Catholic Charities agencies in Baton Rouge, Lafayette, New Orleans, and the Diocese of Houma Thibodaux which are providing disaster assistance to individuals and families. Catholic Charities staff and volunteers are working tirelessly to provide water, food, shelter, and spiritual care to displaced persons. Case management intake is underway in shelters and as waters recede, volunteers are cleaning up damaged properties. 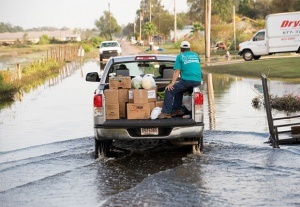 Catholic Charities agencies in the region are interacting daily with people affected by the flood and will continue to provide assistance after the crisis is alleviated. To ensure our sister agencies in Louisiana have the resources they need, Catholic Charities of Southeast Michigan is now accepting financial donations and will transfer 100 percent of funds received for the Louisiana flood crisis relief to those agencies. Be sure to designate your gift to “Louisiana Flood Relief”. Learn more: Call Joyce Hyttinen at 248-537-3304 or email: hyttinenj@ccsem.org.